Ronaldo, also known as "the phenomenon", is considered by many football experts one of the greatest footballers of all time. He was part of the Brazilian national team at 4 World Cups, from 1994 to 2006, and he won the tournament twice. He is the all time World Cup scorer with 15 goals, and a true World Cup Hero. At the age of 18 he was part of the Brazilian squad that won the World Cup in 1994 in the USA. He didn't play any game for Brazil that year but had the experience of being in a World Cup with a winning team. In 1998 he helped Brazil reach the final against France but a stomach flue prevented him from having a final at his level and helping Brazil win the cup. His third World Cup was in 2002, and this would be the one where he would finally put his mark on and write his name in World Cup and Brazilian footballing history. Brazil was drawn in Group C with Turkey, Costa Rica and China. They were the clear favorites in the group and a lock at first place finish. Their first game was against Turkey and Ronaldo started the tournament in the best fashion possible with a goal in the 50th minute to tie the game at 1. It was a great goal, a cross into the box and he sprinted between the defenders to finish with a slide kick. Rivaldo would score a second goal and Brazil would go ahead and win the game 2-1 and get the win they needed from the opening game. Second game of the group was against China. This was their easiest game of the group, and it showed in the scoreboard with Brazil winning 4-0 and Ronaldo scoring the fourth goal in the 55th minute. Last group stage game was against Costa Rica in a game that didn't mean much for the standings of the group but a game that Ronaldo would once again show that he was there to win it all. He scored Brazil's 2 first goals in the 10th and 13th minute of the game in a 5-2 victory. Ronaldo finished the three group stage games with 4 goals. Round of 16 pinned Brazil against Belgium. It wasn't an easy game for Brazil or Ronaldo. The Belgium defense kept him out of the penalty box and was able to stop him from scoring for most of the game. In the 87th minute following a quick counter attack, the ball is crossed into the penalty area where Ronaldo shows up behind the defender and one times it into the back of the net. Brazil was up 2-0 with 3 minutes to go, it was over for Belgium and Brazil was off to the quarter finals. England was the next target in Ronaldo quest for cup glory and they would prove to be a moving target. England's defense was able to stop Ronaldo all game. He wasn't able to have any dangerous runs in the box or any long distance range shots. Their strategy to man mark Ronaldo and force him out of the box to get the ball worked, well until Ronaldinho scored one of the greatest goals in World Cup history. From a freekick Ronaldinho put the ball over David Seaman in the far corner. Ronaldo for the first time in the tournament wasn't the hero, but he still had more to give his country and his team. Turkey had faced Brazil in the group stage and lost 2-1 in a very close match, now they were going to face each other in the semis, in another epic battle. Scoreless after 45 minutes, Ronaldo takes the ball in the last third of the field, dribbles through several defenders and with the outside of his feet he puts the ball in the back of the net. This was one of the most important goals in his career, it put Brazil in the finals of the World Cup for the third tournament in a row. The final was set. Brazil vs Germany, was a match up between the two most consistent teams in this World Cup and in all of World Cup history. Two second half goals from Ronaldo were enough to seal the victory for Brazil and give him his second World Cup trophy. Ronaldo finished the tournament with 8 goals. He was the leading scorer of the tournament (Golden Boot Winner), he was also voted into the All-Star team of the tournament. He finished his career with 15 World Cup goals, best to date. He played 98 games for Brazil and scored 62 goals, he is the second highest scorer for his country. 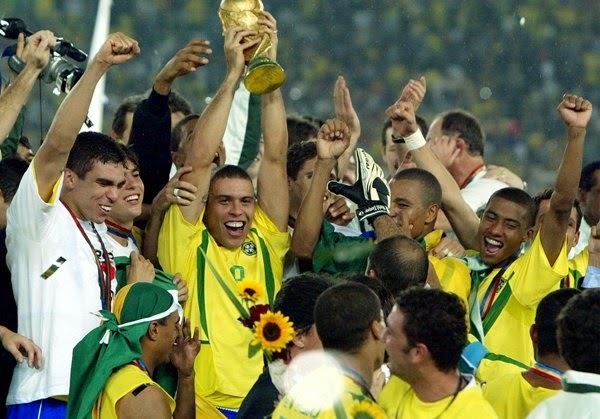 Ronaldo had an incredible World Cup in 2002 and the main reason Brazil won their 5th title.